Words Alive's 10th Annual Volunteer Appreciation Event! An image of our Volunteer Appreciation Event. Volunteer Program Manager, Christina Meeker, stands at the podium in front of a screen that says “Volunteer Appreciation Event." Volunteers mingling over lunch also appear in the image. On Friday April 5th, the community of Words Alive staff, volunteers, donors and supports joined together at the San Diego Public Library to celebrate the many special volunteers that help our organization run so smoothly. As we often say at Words Alive, the volunteers are the lifeblood of our organization. An image of two of our incredible volunteers, Karen Mailn & Margie Roehm laughing at the camera. At noon, everyone filed into the event space, where there were smiles and excitement all around. In an effort to connect volunteers with one another, everyone received a “signature card” at check-in with different prompts listed such as, “dislikes chocolate” or “has attended a Words Alive Cookies & Conversation event.” Depending on how many signatures one was able to collect, the more raffle tickets you earned! This signature card was a great way to start conversation with the many volunteers and board members present, and to get to know one another. Once everyone settled into their seats at around 12:40, the award ceremony honoring our volunteers began. We awarded volunteers in 13 different categories, including: Rookie of the Year, Youth Volunteer of the Year, Leadership Volunteer of the Year, and of course, Volunteer of the Year. Each volunteer who was awarded gave a small but memorable speech all with a common theme, the true reward for them was giving back. Our Volunteers of the Year were Kim & Doug Harrison. In September, Kim Harrison and her husband, brand specialist Doug Harrison, volunteered to lead the organization in identifying how best to convey its brand – in the simplest terms: what do we do, how do we do it, and what does that look like in the community. This exercise has resulted in not only a refreshed logo which highlights the action and activity that our engaging programs ignite in students and their families, but language that better describes who we are and what it means for all of us to be touched by Words Alive. This process has permeated all aspects of the organization – from examinations of our programs, to how we market those programs, how we celebrate and leverage the community partners, to how we look to the future – spreading this impact to every corner of our community and beyond. An image of Volunteers of the Year, Kim & Doug Harrison, with Leadership Volunteer of the Year, Jeffrey Goldman! After leaving the event, these feelings of appreciation and joy for the work we all do together lasted. Words Alive is very lucky to have each of its volunteers, and in turn the volunteers feel very lucky to have found Words Alive. As we gear up to enter our 20th year, we look to the impact Words Alive has had since being founded. Over the past 11 years, we have impacted 21,031 students and 1,546 families. We have given away 154,155 books and we have worked with over 1,255 volunteers. It is clear the mark we’ve all made is substantial. So, to anyone who has donated, volunteered or worked with us to better the communities by changing lives through reading and relationships, we thank you. Here’s to many more years to come with all of you by our side! An image of a group of students in our Read Aloud Program excitedly holding up their books. There are countless reasons why two strangers may connect, but one common reason that has connected all ages is the commonality of stories. As a child, when you discover that your classmate loves the same book series as you, an immediate conversation ensues. Being able to talk about characters, what they think will happen next and why they love the book as much as you do creates a bond. This doesn’t go away with childhood, if anything it intensifies. Reading doesn’t only builds friendships, but entire communities. Words Alive, organizations like the Harry Potter Alliance (HPA), GoodReads or just a classic book club are just a few examples of how the power of reading can bring people together. It may be the fact that every person reading the pages will take a different lesson or viewpoint than the next, and we as humans desire to know and understand one another through these insights. Books also teach us life lessons that inspire us to do something good for our community. Organizations like the Harry Potter Alliance were founded out of a love for the Harry Potter series and have created a whole community of activists who are using popular stories to change the world. John and Hank Green are brothers (and both authors) who have fostered an online community called Nerdfighteria, a community that celebrates many things but chief among them is a love for books and learning. With the internet, it’s easier than ever to find and form communities around a love of books. According to the journal, “Using Parent Book Clubs to Build a School-Wide Reading Community”, a high school class partook in reading aloud throughout the year. This allowed students to “engage in meaningful relationships and social interactions tied to reading, and these connections mattered to them. 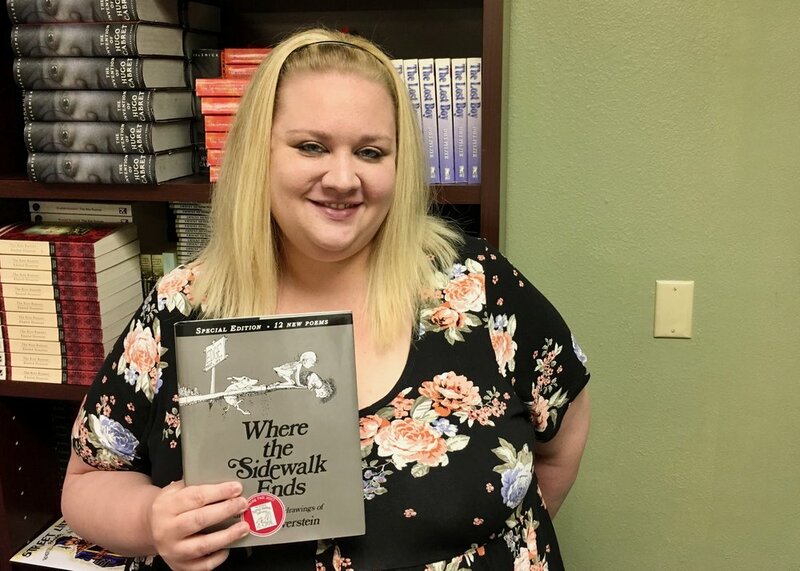 Students took these connections seriously, and they authentically acted in ways to contribute positively to the reading community.” Here, we can see what one could call book club within the classroom. The importance in these communities may seem obvious, but there is more than just reading aloud and discussing books. Organizations like Words Alive understand that communities that value reading help build thriving and intellectual individuals and relationships among one another. Reading, literacy and all it brings is a powerful thing, which is why we at Words Alive are here. Through the passion of reading we have come together to show the importance and positive impact it can make on others. While reading is often done in solidarity, it has the unique ability to bring a huge group together, to understand and bond with one another. Jeffrey Goldman has been a part of the Words Alive family since 2014 and most recently completed his tenure as Board Chair on the Words Alive Board of Directors. Over the past five years, Jeffrey has been a constant source of leadership and inspiration through his commitment to Words Alive and bettering the futures of students in our programs. Jeffrey not only serves on the board, but also volunteers with our Adolescent Book Group as a writing facilitator at the Monarch School. Jeffrey is the publisher at Santa Monica Press, an independent book publishing company, since he founded the press twenty-five years ago. Santa Monica Press publishes an eclectic list of critically acclaimed and award-winning non-fiction books. Prior to Santa Monica Press, Jeffrey spent a decade as an arts and entertainment journalist and editor, working for a variety of newspapers and magazines both nationally and internationally. In addition to serving on the Words Alive Board of Directors, Jeffrey is also a member of the Board of Trustees at the La Jolla Playhouse, where he serves on the Executive Committee and is the chair of the Education and Outreach Committee. Now, let’s hear more directly from Jeffrey! How has Words Alive changed the story of your life? Words Alive has changed the story of my life by making me aware of not only the extraordinary need in the community for advocates of reading and writing, but also of the number of incredibly talented children — brilliant writers — whose talent often slips under the radar of their parents and family members. The joy and fulfillment I receive from helping to spread the love of reading and writing to children, and further encouraging those children who already show a tremendous aptitude in these areas, has brought me endless pleasure and has truly changed the story of my life. I remember reading a book (whose title I’ve long since forgotten) with my teacher and fellow classmates in kindergarten or first grade. It was a mystery of some sort, and before we turned the page to find out the surprise ending, the teacher asked us if anyone could guess what was going to happen. I guessed correctly, and the shock, surprise, and wonderment on her face gave me so much happiness and confidence that I couldn’t wait to read the next book she assigned! My love of reading (and writing) kicked into high gear from that point on! As a book publisher, writer, and editor, I not only use literacy in my day-to-day life, it has been my profession and my passion for 40 years. Jeffrey working with an Adolescent Book Group student at Monarch School. This is a nearly impossible question to answer because there are so many. Certainly Shakespeare and William Faulkner top the list of my favorite authors, and King Lear and As I Lay Dying are my two favorite works by these amazing writers. If forced to choose, I guess I’d go with King Lear. Why? Because it’s such a powerful, tragic story that encapsulates so much of the human condition. I wanted to make an impact on the lives of children and believe that encouraging strong reading and writing skills is the simplest and most effective way to change the story of a child’s life. Working with the kids in the classroom; working with and becoming friends with the incredible Words Alive staff, volunteers, and my fellow board members; and being a champion of Words Alive out in the community. Thank you, Jeffrey, for all you’ve done for Words Alive! Learn more about our Board of Directors here! Farmers Insurance is partnering with Words Alive to host some special events that will help us inspire more students and families to become lifelong learners. Each year, Farmers Insurance hosts a Women’s Day and Farmers in the Community Session during the week of San Diego’s PGA TOUR event, the Farmers Insurance Open. During these special events, Farmers Insurance employees will be spending a portion of their time stuffing 1,000 Kindergarten Readiness Toolkits for our Family Literacy Program. After completing seven weeks of fun and engaging programming, our Family Literacy participants are eager to continue learning and using language as a playtime activity. At the end of the program, graduating families receive a backpack with school supplies, alphabet magnets, glue, crayons, scissors, and more. We encourage families to continue spending valuable time together to ignite quality conversation, which is the foundation for learning at this young age. Words Alive will also be hosting a Read Aloud Program field trip for 60 students from Doris Miller Elementary School sponsored by Farmers Insurance in partnership with the PGA Wives. The PGA Wives will be using our Words Alive curriculum to host a small group read aloud session with students ranging from K-5th grade. At this time, they will also host a small book giveaway where students will receive a copy of the book they are reading and get to choose three of their own to take home. We are excited to have the opportunity to partner with Farmers Insurance and The Century Club San Diego to serve more students and families. Words Alive is fundraising until the last day of the Farmers Insurance Open, January 27. We are vying to earn up to $30,000 in bonus funds. Donate today to help us reach our goals. An image of Andrea with Christina Meeker, Words Alive Volunteer Program Manager, and Patrick Stewart, Words Alive Executive Director, at the 2018 Volunteer Appreciation Event. Andrea Mac Donald has been on our Board since 2013, and we are thrilled to introduce her as the incoming Words Alive Board Chair starting in 2019! Andrea MacDonald earned her Bachelor's Degree in Speech and Hearing from the University of California, Santa Barbara. Following school, Andrea worked as a real estate appraiser, earning many professional designations. In 1992, she moved to New Jersey where she started a residential real estate appraising practice for a leading commercial appraising firm. After returning to California, and as her children grew up, volunteering in the community has been very important to her. Andrea served on the Board for the Solana Beach Foundation for Learning for five years, and was an officer for three years. As VP of Site Development, Andrea oversaw the fundraising for the six Solana Beach School District schools. Other organizations that Andrea has been involved with over the years are PTA, Girl Scouts, Miracle League, and National Charity League. Andrea has not only been on the Words Alive Board since 2013, she has also chaired our Event Committee for many years, providing immense support and organization for our largest fundraising event of the year! We are so excited for what’s to come with Andrea as our Board Chair. Now, let’s hear more directly from Andrea! I have always had books in my life. When I was little, my mother shared her love of reading with my sisters and I. She would take us to the library every week, and share with us how when she was little she decided to read every book in the library, and we would all go to each aisle with her and pick our books - trying to read our way around the library. I have discovered in the last few years, that I love being in the classroom with young children and have recently started working as a Substitute Teacher. I love reading to them, discussing a book with them, and watching them get excited about the characters and the subject matter…..watching the light bulbs going on! When my children were in elementary school, I was on the Solana Beach Foundation for Learning. I oversaw all the fundraising for Solana Beach Schools. Words Alive was an incredible fit for me. Reading has always been important to me, and to be on a Board with a similar mission statement fit. To be able to bring reading and writing to these kids, who may not be exposed to it everyday is so unbelievable and exciting. I am a voracious reader and belong to two book clubs. I cannot tell you one book I love because I tend to enjoy them all. Many times I will read a book and not really enjoy it, then when I go to book club, hear the discussion, and then I’m ready to re-read it with a different perspective. I have loved many books, but because there are so many books out there that I want to read, I have never re-read a book. When I first joined the Board, Words Alive was concentrating on our three programs and doing a good job. But in the last 6 years, Words Alive has grown tremendously. Not only has our staff grown, but our reach has grown. It is really exciting to see how our programs have expanded. I’m looking forward to watching our growth in the future! Thank you, Andrea, for all you’ve done for Words Alive! Learn more about our Board of Directors here! What Words Alive Accomplished in 2018! In April 2018, Words Alive partnered up with Boochcraft to celebrate their new special release flavor. As a San Diego based kombucha brewery, they give back to their community by facilitating projects that support education, food, and energy. All of the gross proceeds from the event were donated to Words Alive, resulting in our ability to serve over 75 families in our Family Literacy Program! Partnerships such as this one have allowed us to reach more families and make a bigger impact than either organization could have done individually. A picture from 2017’s Share Your Love of Reading campaign! The VIP reader had students get up and dance! Our Share Your Love of Reading Campaign was celebrated once again this May and was our most successful yet! We were able to distribute another 2,778 books to our Read Aloud Program participants due to the success of the campaign. Words Alive partnered up with local news stations, council members, and sports team representatives to make appearances in classrooms to read to elementary school students to help encourage their love for reading. Image of a person with their back turned towards the camera. They are standing in front of one of the sculptures our students made for this year’s Art & Literacy Project. In June 2018, our Adolescent Book Group students participated in an exhibition at the San Diego Art Institute titled The Love You Give. Students created pieces of art and poetry focusing on the theme of “duality” and the novel The Hate U Give by Angie Thomas. Local artist Isaias Crow then combined these works of art into communal sculptures. With nearly 100 visitors coming to the exhibition, students were able to showcase their work to their closest friends and family. Students felt proud of themselves for learning and expressing themselves. We had three Words Alive Westreich Scholarship (WAWS) recipients graduate this year! Zaphire Alonso Duarte, Zaira “Lexi” Martinez, and Domminiece Willis are proud graduates of San Diego City College and Southwestern College who are all continuing their studies at SDSU. When speaking about the program and scholarship, Lexi Martinez said, “My love for reading has been restored since I have been involved with them and I’ve always found a valuable support system within the organization.” We look forward to seeing where their degrees take them and helping more WAWS scholars in the future! A group picture of The Butterfly Project presenters with Stephen Keiley's 8th grade class at Monarch School and Words Alive ABG volunteers. Words Alive provided the literacy piece of the Holocaust unit for Monarch School’s 8th graders. The students read three books: Night by Elie Wiesel, Maus by Art Spiegelman, and American Ace by Marilyn Nelson — then discussed the books and wrote about the themes with their volunteer team in bi-weekly sessions. As a culminating project, Words Alive partnered with The Butterfly Project, a local Holocaust education initiative. Children of Holocaust survivors led an engaging presentation and invited the Monarch students to each paint a butterfly to represent a child who died in the Holocaust as part of a larger global awareness campaign. An image of the 2018-2019 Words Alive Westreich Scholars! In August, we recognized our 2018-19 WAWS scholarship recipients. Words Alive awarded $37,500 in scholarships for the upcoming academic year. Nine of the scholars are returning to the program after participating in at least one other year and are receiving a $3,500 scholarship, while three first-time scholars are receiving a $2,000 scholarship from the organization’s Julia & Zoey Shenkman Award. Additionally, each scholarship recipient is matched with a mentor. The mentors meet with their student throughout the school year to help provide guidance and, often times, a shoulder to lean on. 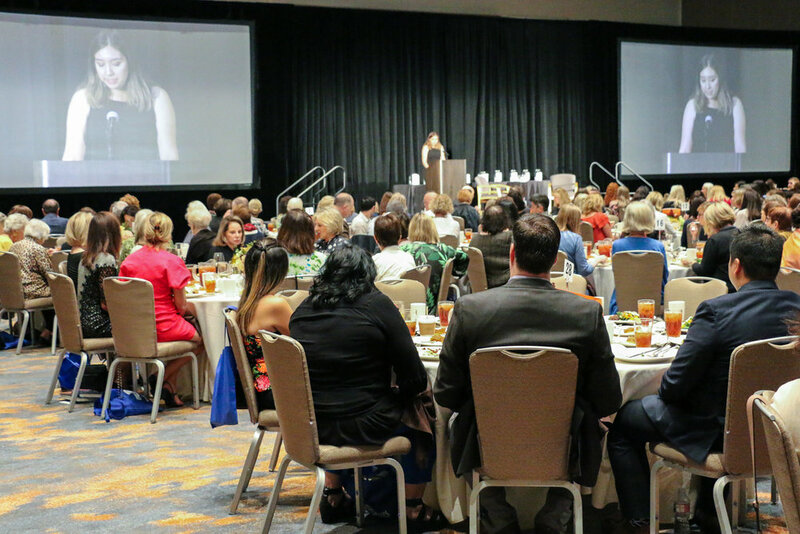 An image of our audience at the 15th Annual Author’s Luncheon & Fundraiser watching Brittany Jackson, former ABG and WAWS participant, give her speech. Our largest event of the year was the 15th Annual Author’s Luncheon & Fundraiser. The marketplace, silent auction, and raffle gave patrons the opportunity to win spectacular prizes while also directly benefiting the three primary programs of Words Alive: Read Aloud Program, Teen Services Program, and our Family Literacy Program. The funds generated at the Author’s Luncheon & Fundraiser make up a considerable portion of what Words Alive needs to continue serving thousands of children and families each year. Author Mark Oshiro poses with one of our classes from Monarch School after giving a talk about his book, Anger is a Gift. Most recently, we had author Mark Oshiro speak with students from Monarch School and Lindsay Community School. He focused on his life and his book, Anger is a Gift, which tells the story of resilience and loss. The students in attendance read the book over the past semester and were able to discuss the book and the themes surrounding it. Our programs focus on new, diverse, and relevant texts such as this one so that students can see themselves and their experiences represented. 2018 has been one of our best years yet and we are excited to continue inspiring a commitment to reading with the help of you, our community supporters. If you would like to get more information on upcoming events and programs, visit our page here. If you would like to donate or become a fundraiser to help us continue providing these programs, check out our Champions for Youth campaign that is running through January 27, 2019! 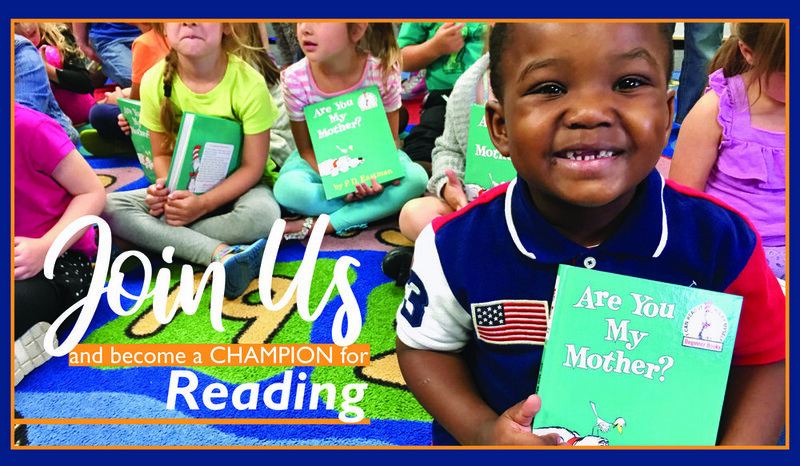 Join Us & Become a Champion for Reading! November 27th was #GivingTuesday, a day to start the holiday season by donating to nonprofits as an act of philanthropy. Gaining more support each year, there was an estimated $274 million given to nonprofits in the United States on Giving Tuesday in 2017. Words Alive is joining in the season by launching our exciting new peer-to-peer fundraising campaign, Champions for Youth. Peer-to-Peer fundraising is a social form of campaigning that focuses on building relationships with our supporter’s closest network -- their friends, family, or coworkers. As a non-profit, much of our time is spent writing extensive grant requests to donors and organizations. However, nothing compares to when our existing supporters reach out to their own social circle and seek connections that we would not otherwise be able to make. You are much more likely to support a cause that is important to a close family member or friend than from someone you have never met -- which is why we are so excited to get your support for our new campaign! What is the Champions For Youth Campaign? Champions for Youth is the key charitable initiative of the 2019 Farmers Insurance Open. Administering the program is the Century Club of San Diego, who selected 10 organizations that support youth and their families to participate. Words Alive will receive 100% of each donation with the potential to earn bonus money from the Farmers Cares Bonus Pool (which contains $260,000), based on the amount of donors and money we receive in relation to the other participating charities. For example, when 150 people donate at least $10 to our campaign, we’ll earn a bonus of at least $10,000 on top of what we’ve already raised. Incentives such as these continue throughout the campaign! How do I Get Involved in the Campaign? An image of Read Aloud Program students exploring a book together with Words Alive volunteer Sharon Gruby! A $100 donation to our Champions for Youth campaign provides 75 new books for children to take home and build their libraries. If you are interested in learning more about our participation in Champions for Youth or would like to see our training dates that support you in carrying out peer-to-peer fundraising, visit our page here.